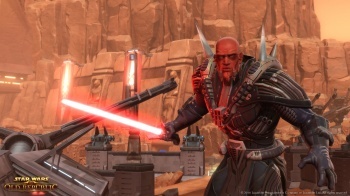 Despite rumors to the contrary, Star Wars: The Old Republic will ship with a fully operational achievements system. TOR's lead writer Daniel Erickson confirmed that achievements had made it to launch at the recent Eurogamer Expo. Erickson said TOR's achievements wouldn't be frivolous, like having to "drink six beers and fart in a cantina," at least, not at first. He said that the achievements that had made the cut would reward the player for doing heroic and notable actions, like visiting each planet and defeating the world boss. The slightly more silly achievements would appear in the game, but BioWare would add them later. While they're not going to be to everyone's tastes, achievements are a rather neat way of expanding a gameplay experience without making it all about fighting bigger and badder bosses. Travelling to Tatooine so you can dance on a table and get your "Watch Out for the Rancor" achievement, or flying really slowly during one of the space battles to get the "Fly Casual" achievement might not be quite the same as defeating a maniacal Sith Lord, but it's still fun to do - if you're into that kind of thing, of course.